Just for the kids....and just for fun. A "class" just for the kids. Based more on general learning of farm life....all the fun stuff! 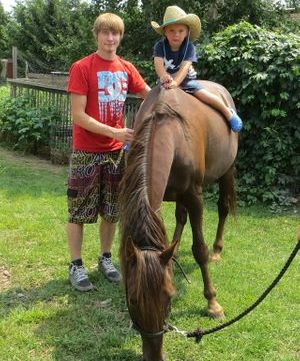 Pet the animals, ride a cow, give treats to the alpaca, talk to a turkey, cuddle a baby bunny, snuggle a goat and MUCH more. 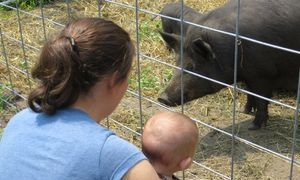 We do an organized farm tour of all the livestock and allow hands-on of almost all the animals. 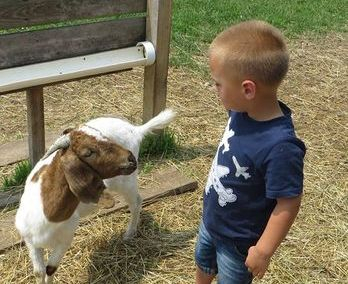 We often have baby animals to get really up close and personal with. All instruction and activities are geared towards individuals from age 5 to around age 10 but I assure you even "kids" from 11-99 should have a great time! 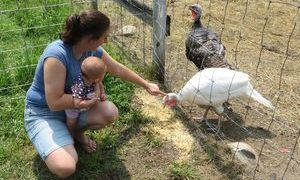 Classes will generally run about one or two hours but may run a little longer depending on how many children attend as we want to make sure each child has a great and fun experience with each animal. Supervised children under 2 are free. Early tour begins at 11:00am and the late tour begins at 2:00pm. Please call first to make sure that the open tours will be held. No open toed shoes. Wear clothes that can get dirty! How is the view up there? Even the big kids have a great time. 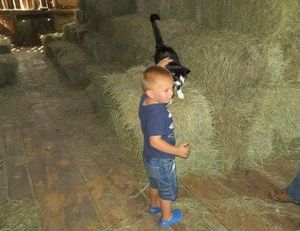 Barn cats and hay lofts.